Dying for a Prize- Is it Worth It? I was just reading on yahoo about the guy who decided to eat 28 raw eggs in a dare. First off I want to say that is totally nuts and who would do such a thing just to prove he/she could do it in the first place. Second, I want to say that he died from this stupid act. I would never want to wish someone harm, but what in the world was going through this guys mind? Yes, he proved he could eat 28, but then he died in the process. I don’t get it! Salmonella likely killed the man due to the possibility that the eggs were not pasteurized or consumed in a raw state. In some cases, sickness from exposure can come on suddenly and is potentially deadly. While I was reading this article, I couldn’t help but think back to the guy who ate a buttload of cockroaches so he could win a free snake for his friend. 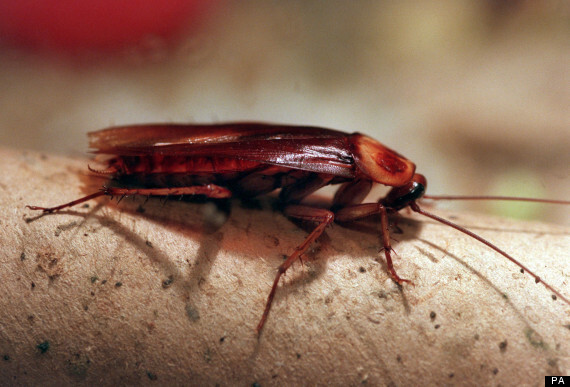 They said his cause of death was chocking on roach body parts. WOW! I wonder how they came to that conclusion? Oh and let me not forget Kobayashi. he is the record holder for eating the most hotdogs and he tops his record for cow brains. 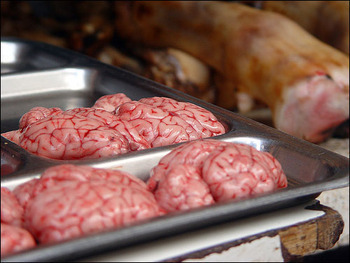 Picture human brains, but smaller and cooked a bit. Mmmm…makes you hungry, right? He ate 57 (17.7 pounds) cow brains in 15 minutes. That is nasty when I think about that. Yuck and double yuck. OH! Here is another one and you wouldn’t think that drinking water could kill you, but it can. A woman in Sacramento California who competed in a radio station’s contest to see how much water she could drink without going to the bathroom died of water intoxication. The contest was titled, “Hold Your Wee for a Wii” contest in which KDND 107.9 promised a Nintendo Wii video game system for the winner.